Besydes the ile of Megaly, to the north northeist, lyes ane ile callit Pabay, ane myle lang, manurit. In it is a guid take of fische. It perteines to the bishope of the iles. . All thir nine iles forsaid had a chappell in every ile (Monro 1549 (1994), 507-8). 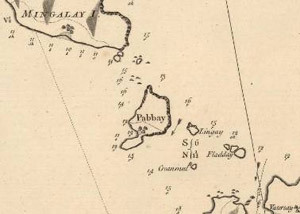 Pabaigh lies in the centre of this group of islands, separated from Mingulay/Miùghlaigh to the south west and from Sandray/Sandraigh to the north east by the strong tidal races, which also contain the fish for which the islands are noted (Ordnance Survey 1878, Original Object Name Books, Inverness-shire, Book 2, 112 115; Edwards 1981, 3; Figs. H4.1 and H4.2). Sandraigh and Pabaigh are separated by the far smaller Lingeigh and Greanamul, which are described by Melville as two of the nine isles (1603-4, f.10v), although they are not listed as such by the majority of other cartographers and early authors. The south western headland of Sandraigh is named Aird Pabbach, probably because it faces onto Pabaigh or because this is where the Pabbay men landed (Stahl 1999, 104, 253). Pabaigh lies about nine miles from Castlebay in Barraigh, a two hour sail with a fair wind (Wedderspoon 1915, 325). On the Southend or southwest [of Barraigh] there are severall litle Illands which are profitable and fertill both of corne and abundance of milk. And none can goe with scutts or boatts to those Sowthwest Illands but in those tymes of the yeare such as Aprill and Summer and in the beginning of August. The Master or Superior of these Illands hath in due payment from the Inhabitants and tennants of the saids Illands for his dewtie. the half of ther cornes butter cheese and all other comodities, which does Incres or grow to them in the yeare, And hath ane officer or serjeant in everie Illand to uptake the samen. The names of those Illands is called Watersa, Sandira, Pappa, Mewla, and Bearnera. These Illands are farr off from all Countries (Anon. c.1630, 177). 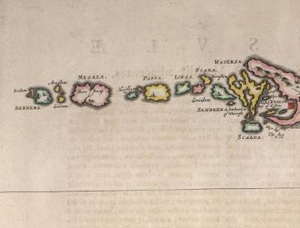 Martin Martin's description is similar, although he appears to have confused the individual islands, reversing Pabaigh and Miùghlaigh on his accompanying map. Like Monro, he may never have actually visited them. It is probable that his belief that Pabaigh could only support five sheep, with the sixth degenerating into a poor skeleton, must refer to Lingeigh or one of the smaller islands around Pabaigh or Miùghlaigh (1703 (2003), 98; Campbell 1936 (1998), 41, 46). Martin does note that both Pabaigh and Micklay (Miùghlaigh) afforded 'excellent hawks' (1703 (2003), 98). Pabaigh, which is entirely underlain by gneiss, cut across by a number of basalt dykes, rises from a flatter east coast to precipitous cliffs on the west side (Fig. H4.3). The western half of the island is fairly desolate, consisting either of exposed bedrock - from which the turf has almost certainly been stripped, as the field dykes now sit directly on the bedrock (Jill Harden, pers. comm.) - or blanket peat, classified in modern land capability terms as 6/3, land capable only of supporting rough grazing. Buxton notes that the supply of peat must have become exhausted during the nineteenth century, the inhabitants resorting to the island of Lingeigh to the north (1995, 155; also see quote from Wedderspoon below). The western cliffs, because they are not as high, do not support the same number of seabirds as those of Miùghlaigh or Bearnaraigh (Edwards 1981, 3). At least in the nineteenth century - and probably for a long time prior to this - the inhabitants of Pabaigh exploited those of the other two islands (Buxton 1995, 156). 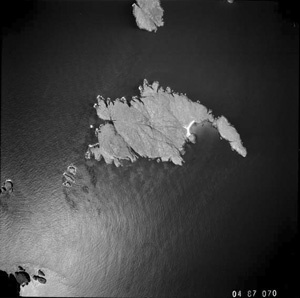 The differential erosion rate of the gneiss and the basalt has resulted in the formation of a small, central valley, cut off from the rest of the island and from the sound of the sea, in which scrub woodland has managed to survive (ibid., 150; Foster 2000, 82). The field walls, which run along the edges of the principal geological dykes to divide the island in half, also enclose this valley (Jill Harden, pers. comm.). 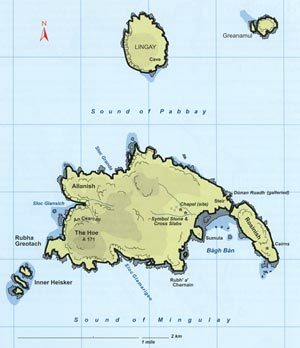 The distinctive curving peninsula of Rosinish, also known as Rubha Phabach (Stahl 1999, 245-6, 253), at the north-east corner is now separated from the main part of the island, but was still connected by an arch at the time the OS First edition map was compiled, although, according to the Admiralty Chart, this had collapsed by 1865 (Ordnance Survey 1878, Original Object Name Books, Inverness-shire, Book 2, 111; the peninsula also appears to be separate on Thomson's 1820 map (Fig. H4.5)). A broch or galleried dun, which lies just to the north west of this arch, has been now been almost entirely removed by the sea, although not before rescue excavations could be undertaken (Foster 1996; Foster 2000, 82; Foster and Pouncett 2000; NMRS no. NL68NW 1, SMR no. 1427, NL 6128 8760). Standing stones are noted on the OS First edition map (1880) and by Sharbau in 1901 at the very end of the peninsula (NAS RHP44187); these must be the cairns noted on the current editions of the OS map. One of the islanders . also mentioned that till a few years ago the plateau was covered with grass, and when the peat on the island was used up they cut the turf for fuel, and the wind blew off the underlying sand, which was about six feet deep, and exposed the old surface containing the middens (Wedderspoon 1915, 326-7). Landing is done on the rocks, and is always attended with discomfort, if not with danger even in a moderate swell, and it is quite impossible to land when the sea is at all rough. We steered into a small bay with a sloping sand beach, but instead of landing there, the boat was run into a natural dock about six feet in width, where the gunwale was above the opposing rock, or three feet below it alternately, as the boat rose and sank with the swell, which made landing a matter of some difficulty . During our stay on the island the wind and sea had risen, and at was impossible to embark where we landed, and the boatmen directed us to cross the rocks to a cove on the north side, while they proceeded to round the eastern spur of the island, which extends a long distance outwards as a dangerous reef. We waited anxiously for the boat which was experiencing rough weather in the open sea when we left the south side, but our suspense was relieved when she hove in sight on the top of a wave, well inside the headland, to be lost to view again as she sank mast down in the trough of the sea. It was a rather exciting experience boarding the boat when it could be manoeuvred within leaping distance of the rocks, but we all got over safely with nothing worse than a drenching, and ran before the wind to Castlebay in an hour (1915, 325, 327). 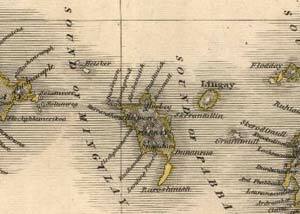 Two wells are marked on the OS First edition map of the island (1880), one lying within an area of improved ground close to the track leading from the main settlement cluster at Bàgh Bàn to a small building at Steir and one at the head of Sloc Glamarigeo on the south side of the island. Neither appear to be close to areas where settlement has been concentrated, the principal water source probably being the stream running down to Bàgh Bàn from the west (Edwards 1981, 3; Foster 2000, 85, 90). Macculloch noted the presence of 'a few fishermen at its flatter eastern end' in the early nineteenth century (Macculloch 1819, 85). In 1901, Sharbau also shows three buildings, with an area of cultivation to the west of them (NAS RHP44187). In comparison to the other 'Southern isles', the population of Pabaigh does always seem to have been low, seemingly focussed on a single area of settlement in each period (Foster 2000, 90-2). There were a number of breaks in population during the nineteenth century, with families coming in from South Uist, who were probably not accustomed to having to rely on fishing for part of their living; traditionally these families are thought to have been engaged in illicit distilling (Edwards 1981, 10; Buxton 1995, 153-5). This may explain why the majority of the place-names, many of which are of Norse derivation, are for points along the coastline, leaving the interior almost completely blank (Fig. H4.5). This absence is rectified to some extent by Sharbau's 1901 estate plan and by names collected from local informants (Stahl 1999; Stahl manus. collection of names for The Papar Project). From 1850 onwards, the island was let as a single sheep farm, in conjunction with Outer Heisker/Theisgeir a-muigh, although there were still 10 acres of arable in 1891 and parts of the island must have been sub-let (Edwards 1981, 10; Buxton 1995, 154). Pabaigh was abandoned for permanent settlement in 1911 or 1912 (Edwards 1981, 10; Buxton 1995, 153-4). On what is now a mound some 10 feet high, on the south-western border of the sandy slope running up from Bagh Ban on the eastern shore of Pabbay, about 150 yards from the high-water mark, are the indistinct foundations of an oblong church of stone and lime measuring about 31 feet in length and 14 feet in breadth externally, and orientated slightly north of west and south of east. Great quantities of human bones are reported to have been found here from time to time as the sand drifted away (RCAHMS 1928, 126). The burial ground is within a few yards of the dwelling-houses, and it at once arrested attention on account of its peculiar appearance; it is conical in shape, about 30 yards in circumference, enclosed in a ring of detached boulders, and rises to a height of 15 feet or thereabout. The top is narrow, affording space for one grave only. The sides are very steep, and it is difficult to know how interments can be made at all, but it is covered with graves from top to bottom, each marked at head and foot with an upright slab of native rock, from three to six feet in height, which adds to its unique appearance. There is very little grass on the mound except on the graves, which are neatly covered with turf, and the bare parts show that the interior consists principally of sand, bones and shells. The latter are all of the edible mollusc varieties and very numerous, though much decayed. Among them were found a few horse teeth, several large tusks, also teeth of the ox, and a number of bones of the tooth-pick pattern. There can be no doubt the burial ground occupies the site of a prehistoric midden, which by some process of evolution came to be used as a place of interment in the distant past (Wedderspoon 1915, 326). While coursed stonework is apparently visible near the top of the mound on Beveridge's photograph, it is not possible to confirm the presence or absence of a building. A number of upright stones, as well as another stretch of walling are visible around the base of the mound (the latter not so prominent in Beveridge's photograph, though the graveyard does appear to be enclosed on the OS First edition map (1880)). The mound is now far more grassy than when seen by Beveridge and Wedderspoon in the early twentieth century, although it is still subject to wind erosion (Fisher 2001, 106; Fig. H4.7). Nonetheless, scattered gravemarkers, as well as lengths of stone revetting around the mound, can still be seen. The mound lies in the curve of a stream and appears particularly prominent from the downslope (east) side. From the north-east side, the mound has a very stepped appearance (Jill Harden, pers. comm.). 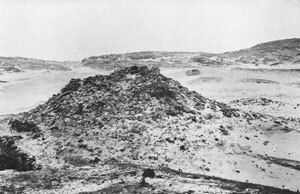 The continual shifting of the dunes in the later nineteenth century revealed that the mound was located on top of a prehistoric midden, although much of this is now also grassed over (Wedderspoon 1915, 326; Foster 2000, 82-3; NMRS no. NL68NW 3). More recently, a shell midden was visible near the base of the mound on its east side (Foster 2000, 82). One of the stone scatters surrounding the mound has been partially excavated, revealing a complex cellular building, which is possibly of Bronze Age date (Foster 2000, 271-7). Even if the presence or absence of a chapel can no longer be confirmed, a Pictish symbol stone, as well as three other cross-incised stones, can all be firmly associated with the mound (Fisher 2001, 106, no. 40; Fisher 2002, 42; Figs. H4.8 and H4.9). The symbol stone was first noticed by Fr. 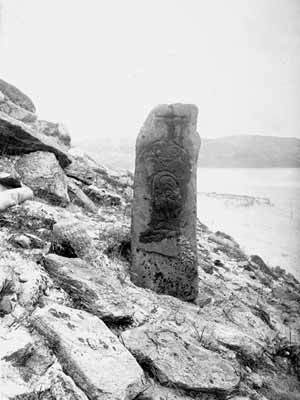 Allan Macdonald of South Uist in 1889, when revealed by blowing sand and is one of only two from the Western Isles, although a total of eight are now known from the northern half of the West Highlands and Islands, outwith the principal area of Pictish influence (Anderson 1897, 299-300; Allen and Anderson 1903, 111; Fisher 2001, 12). The stone is a roughly-shaped slab of gneiss, with a deeply incised linear cross on one side above a crescent and V-rod and the flower symbol; the ornament of the symbols suggests that they are of eighth century date, while the cross appears to have been added at a later date (Fisher 2002, 42). This stone has obviously moved up and down the mound more or less continuously during the last hundred years, generally aided by human hands, and is now located at the foot of the southern side of the mound (Fisher 2001, 106; Pat Foster, pers. comm.). The three cross-incised stones were first noted by the RCAHMS in 1915. All are of gneiss, are pillar-like in form and are located on the south side of the mound, two near the mound's summit and one at the base (RCAHMS 1928, 126; Buxton 1995, 153; Foster 2000, 82; Fisher 2001, 106, no. 40; there are discrepancies in these accounts between the location of the stones, which probably reflects that they, like the symbol stone, have moved around). The two tallest stones have linear crosses of very similar form to that present on the symbol stone, although the cross on the larger of the two stones is enclosed in a cruciform frame which recalls crosses on St. Kilda and at Ellary in Kintyre (Fisher 2001, 13, 106; Fisher 2002, 42). The final pillar stone is apparently much shorter and has a Latin cross incised into each face. None of these crosses are very dateable, but, along with the linear cross on Bearnaraigh, probably do belong to the pre-Norse period (Fisher 2002, 42). There is an additional cross-incised stone in the dyke by the sheep fank (Jill Harden, pers. comm.). One of the islanders produced a bronze pin about six inches in length, which had been found there. Many old things, he said, had been got and sold to Jew pedlars at Castlebay (Wedderspoon 1915, 326; Fig. H4.10). ... This Font was for centuries an object of credulous belief to the inhabitants of Pabbay and the other southern isles of Barra. 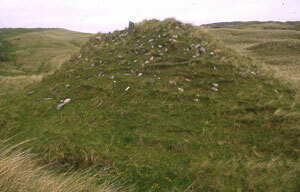 These simple people implicitly believed that the touch of this font like that of another stone in S. Mary's burying ground (Cladh Naomh Moire) in the neighbouring Island of Bearnaray (Barra-Head) was efficacious in preventing and removing many mental and physical disorders incident to themselves and their flocks. The lixivium found in the font was considered doubly consecrated, firstly through contact with the already consecrated Font, and secondly through the friendly agency of some invisible and mysterious power that presided over the scene. The virtues of this salinated water were deemed secondary only to those of the water consecrated by the priest (notes by Alexander Carmichael, quoted in Cheape 2008, 130). As the only notice of a dedication associated with the graveyard on Pabaigh, Carmichael's find is of particular significance. In addition to these finds, a possible eremitical site below The Hoe has been noted by Jill Harden (Foster 2000, 85, no. PY34, NL 5913 8716). It consists of a low stony mound, with a figure-of-eight form, measuring 8m by 3-4m. The site is in a very isolated location, below the cliffs on the west side of the island, reminiscent of Sgurr Ban nan Naoimh on Canna. The Hoe is known orally as An t-Aonach Pabach, 'the Pabbay plateaux' (Stahl 1999, 128, 290). Separated from Mingulay by the wild Sound of Pabbay is the island of Pabbay, now deserted and a grazing place for sheep and cattle. There is an old graveyard here: it is unusual, in that it is on an artificial mound, the graves being near, or on, the summit of the mound. Through the action of water some of the bones were exposed of a man of exceptional stature. My informant was born on Pabbay. His father was a man of six feet four inches in height, and the jaw-bone which became exposed was so large that it 'fitted over his jaw, and scarcely touched his whiskers'. In a stone coffin was found a skeleton with a clam shell over the face. Clam shells were used as drinking cups, and it has been suggested that this man had been buried with his favourite drinking shell. Father John MacMillan, a man much interested in old matters, and a grand singer of the Oran Mór, tells me that he believes the composition of classical pipe music, Bodach na Sligean (Old Man of the Shell), was composed on the finding of this skeleton on the lonely island of Pabbay (Seton Gordon 1950, 274). Though Seton Gordon ascribes the discovery of the skeleton to water erosion, in a late nineteenth century version of the story recorded on Barraigh, it was believed to have been revealed following a great storm, which blew away the covering sand (Jill Harden, pers. comm.). If the shell covering the skeleton's head was a scallop shell, rather than a clam, then this would possibly suggest that the occupant had been on pilgrimage (ibid.). The Natives have St. Barr's Wooden Image standing on the Altar covered with Linen in form of a shirt, all their greatest Asseverations are by this Saint. I came very early in the Morning with an intention to see this Image, but was disappointed, for the Natives prevented me, by carrying it away, lest I might take occasion to ridicule their superstition, as some Protestants have done formerly, and when I was gone, it was again exposed on the Altar. They have several Traditions concerning this great Saint. There is a Chappel (about half a mile on the south side of the Hill near St. Barr's Church) where I had occasion to get an account of a Tradition concerning this Saint, which was thus. The Inhabitants having begun to build the Church, which they dedicated to him, they laid this Wooden Image within it, but it was invisibly transported (as they say) to the Place where the Church now stands, and found there every morning. This Miraculous Conveyance is the Reason they give for desisting to Work where they first began. I told my Informer that this extraordinary Motive was sufficient to determine the Case, if true, but ask'd his Pardon to dissent from him, for I had not Faith enough to believe this Miracle ; at which he was surpriz'd, telling me in the mean time, That this Tradition hath been faithfully conveyed by the Priests and Natives successively to this day (1703 (2003, 92-3). I am preparing to set out on the 10th of this month for Pabbay. I have not yet told you of this plan of mine fearing that the trouble and danger of it might make you anxious, for it really is a strange and weird place. Still, the hope we have of bringing back many stray sheep to the Lord's Fold, our trust in His goodness, and the grounds we have for hoping that the inhabitants of this island, not being infected with heresy, can, with God's grace, remain faithful to our religion if once instructed-these motives urge us to scorn the danger and even death and to set out with the Help of God to Whose Will I submit myself (quoted in Mackenzie 1936 (1998), 10). Father Duggan fell ill before he could leave South Uist for Pabaigh in May 1657 and died soon after. Though the context does imply that Duggan was intending to visit Pabaigh, Barraigh, the description does not quite ring true; Mackenzie believed that Pabaigh, Harris, was meant as the inhabitants of the 'Southern isles' would already have been reconciled to the Catholic faith, while Campbell thought that he was intending to visit St. Kilda (Mackenzie 1936 (1998), 10; Campbell 1992, 82). At the beginning of spring I landed upon another island, named Barra, where I found a people so devout and anxious to learn that I was astonished. It was enough to teach one child in each village the Pater, Ave and Credo; in two days the whole village knew them-children and adults. I have received all the leading inhabitants into the Church, including the young Laird with his brothers and sisters. There is hope of getting the old Laird on my next journey. Amongst the converts is a minister's son, whose devotion gives great edification throughout the whole district where he is known (quoted in Mackenzie 1936 (1998), 8-9).
" There is a burying-ground in Mingula. It is situated at the north side of the small river or burn that runs to the sea through the middle of the village. It is in a most ruinous condition ; there has been a wall of loose stones around it, but the cows and horses are allowed to graze in it, and it is covered with weeds. There are no tombstones in it more than some rude ones at the heads of the graves, nor any trace of a church or chapel that time oldest inhabitant ever heard of ; but I believe the people always meet on Sundays and Fast-days to hear prayers at one of the elder's houses. There is a burying-ground in Bernera, and one also in Pabba, both in the same ruinous state" (quoted in Muir 1885, 54). A new Catholic chapel was built on Miùghlaigh, with its larger population, in 1898, but one of the few remaining families on Pabaigh was renting a pew in the church on Barraigh in the early nineteenth century (Buxton 1995, 121, 157). The medieval parish church of Barraigh, with its two attendant chapels, is located at Kilbar on the north side of the island (RCAHMS 1928, 123-5, no. 436; Fisher 2001, 106-8, no. 41; NMRS no. NF70NW 3). Prior to the Reformation, the parish appears to have been an independent parsonage, lying within the patronage of the Lords of the Isles, until 1427 when it appears to have passed - along with the lands of Barraigh - to the MacNeils (Cowan 1967, 94). The architecture of the church suggests a late medieval date, but the dedication to St. Barr and the presence of a tenth to eleventh century cross-slab inscribed with Norse runes, as well as three cross-marked slabs, attest to a much earlier origin for the site itself (Fisher 2001, 107-8). On Barraigh, there were also chapels dedicated to St. Brendan or St. Michael (RCAHMS 1928, 125-6, no. 437; NMRS no. NF60SW 1) and to St. Mary (Branigan 2005, 19; NMRS no. NF70NW 4). As on Pabaigh, little is known of the other chapels on the Bishops Isles. The chapel on Miùghlaigh was dedicated to St. Columba, but no trace of it could be found within the graveyard in the nineteenth century, although a corner of a building has been identified more recently by Buxton (Ordnance Survey 1878, Original Object Name Books, Inverness-shire, 124; Muir 1885, 54; Buxton 1995, 31; Branigan 2005, 20; NMRS no. NL58SE 2). The dedication of the chapel on Bearnaraigh is no longer known, but a cross-incised pillar still stands in the small, enclosed graveyard, with its central stony mound, providing further evidence for Early Christian activity in the 'Southern isles' (Buxton 1995, 140-1; Fisher 2001, 105, no. 39; Branigan 2005, 20; NMRS no. NL58SE 3). The graveyard, and chapel dedicated to St. Bride, on Sandraigh have now disappeared entirely under sand (Buxton 1995, 158-9; Branigan 2005, 20; NMRS no. NL69SE 1). On Bhatarsaigh, there is a graveyard, containing the footings of a lime mortared chapel, which is known as Cille Bhrianain or Caibeal Moire nan Ceann, the Chapel of Mary of the Heads (RCAHMS 1928, 137, no. 464; Branigan 2005, 19-20; NMRS no. NL69NE 4). Ordnance Survey, 1878 (1880). Inverness-shire. First edition. 1:10,560. Sheet LXIX. Ordnance Survey, 1901 (1904). Inverness-shire. Second edition. 1:10,560. Sheet 69. Ordnance Survey, 2003. 1:25,000. Explorer 452 (Barra & Vatersay/Barraigh agus Bhatarsaigh. Eriskay & Mingulay/Eiriosgaigh agus Miùghlaigh). Edition A. Ordnance Survey, Original Object Name Books. Inverness-shire. Barra. Book 2. NAS RH4/23/106. Ordnance Survey, 1981. 1:100,000. The Outer Hebrides. Uist and Barra South. Solid Edition. Soil Survey, The smaller eastern half of the island is classed as 6/1, while the rest of the island is 6/3. Of all the 'papar' islands in the Hebrides, Pabaigh Barra is the one which appears to provide the most likely situation for an early Christian community. Its very remoteness at the tail end of the Outer Hebrides seems to be ideal for the eremitical side of the early Christian church, while the evidence of early sculpture on the island is a clear marker of its significance as an ecclesiastical site. This is in complete contrast to all the other Pabaigh islands, none of which are known to have produced any early Christian sculpture (see Fig.Intro.2 from Fisher, 2002, 41; this does not include Paible on Taransay (H7) as we will see). Yet this Pabaigh was probably more than an eremitical refuge, for it had sufficient natural fertility to be able to support prehistoric communities, as well as a more modern population. Above all the Pictish symbol stone and the fine Pictish pin (Figs. H4.9 and 10) bear witness to a secular population which apparently resided here in the late Iron Age. 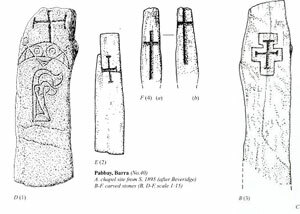 The survival of the stone, one of only two known symbol stones from the Outer Hebrides certainly is evidence for the importance of this Pabaigh, and should perhaps alert us to some strategic significance. Rather than being merely a remote refuge, it may have had some value for seafarers, or those patrolling the sea routes against invaders from the north.